“We’ll be coming to town next week; will you have them then?” we queried. You gotta love small-town Maine. And, if you love lobster, you gotta love Rockland. This mid-coast town (and embarkation point for several windjammer cruises) is host to the Maine Lobster Festival, running Aug. 1-5 this year. This wildly popular event draws around 20,000 revelers to see the coronation of the “Maine Sea Goddess,” lobster crate races, a parade, and live entertainment (not to mention the spectacle of people dressed up in lobster suits). Of course, there’s lobster — about 20,000 pounds of it were served at the fest last year, steamed in “the world’s largest lobster cooker” on the waterfront. But we couldn’t wait for August. We wanted lobster now, just as the season was starting, and before mid-June, when Maine’s high season begins and crustacean-crazed tourists take over the beloved Vacationland. 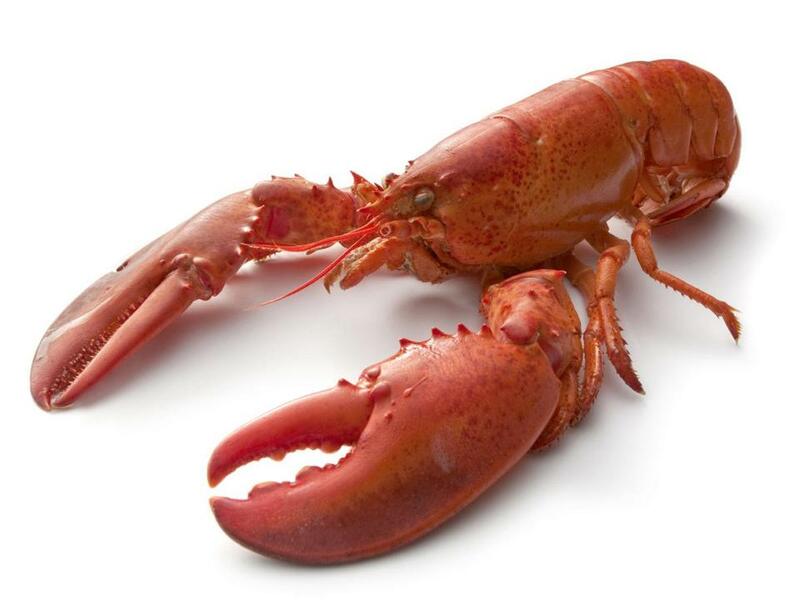 While it’s true that lobsters are harvested year-round in Maine, the majority are caught between late June and late December, when lobsters are most active, according to the Maine Lobster Council. Rockland’s lobster shacks and pounds start to open on Memorial Day weekend, when lobsters and tourists get more plentiful. So, we decided to go road-tripping to Rockland to get an early taste of summer — and to see how much lobster-y delicousness the town that bills itself as the “lobster capital of the world” could deliver in a 24-hour period. We brought along a ringer: Diane’s son, Connor, a college freshman who was tired of dining hall fare and eager to be a lobster taste-tester. 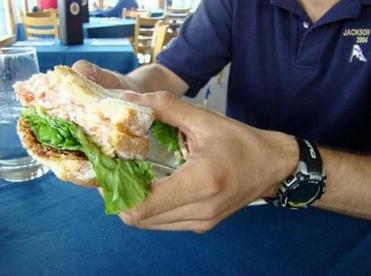 ARCHER’S - The lobster club is loaded with lobster and bacon, lettuce, and tomato on crusty bread. Of course, “Maine’’ is synonymous with “lobster.” Rockland is one of the state’s big lobster harvesting spots, and you see reminders everywhere: At By George Jewelers, we saw necklaces adorned with tiny gold lobster claws. At the Dowling Walsh Gallery, we encountered sculptural lobster claws made of glass. Then there was the creepy trio of caroler-type dolls with painted-lobster-claw faces at Lucky Dog Gallery. But we were there to eat, not shop. Armed with suggestions from the “lobster concierge” at our inn, we headed to our first lobster stop, Archer’s on the Pier. Lynn Archer won the Food Network’s “Throwdown With Bobby Flay” with her lobster club sandwich. (Tip: You can also try the club at Archer’s downtown restaurant, the less-fancy Brass Compass, where it’s $5 cheaper.) But we’re suckers for a water view, the perfect backdrop for the “triple-decker” of lobster with mayo, slab bacon, lettuce, and tomato on crusty bread, served with a choice of two sides. This set us back $25. But it was a huge sandwich, and “she puts two lobsters’ worth of meat in there,” our waiter told us. It was a medley of textures and tastes: salty, crunchy, and slightly sweet. “Definitely an unparalleled sandwich,” Connor declared, although the bacon (“the candy of the meat world,” he added) might offend lobster purists. For them, Archer’s menu offers steamed lobster, lazy lobster, and an entire Downeast lobster bake with all the fixings ($38, at press time). We headed to Main Street to visit an old favorite, the Rockland Cafe, a no-frills diner that’s open for breakfast, lunch, and dinner. There’s not much in the way of ambience, and the service can be gruff, but the price is right: a lobster dinner is under $20. Over time, we’ve sampled the lobster salad, the lobster-studded seafood lasagna, and the dish worth going back for: seafood chowder ($6.99-$8.99), a thin broth loaded with chunks of fish and shellfish. What else should you always order at a Maine diner? Blueberry pie, of course. 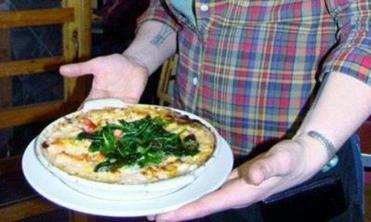 CAFE MIRANDA - The baked lobster mac ’n cheese is studded with tomatoes and topped with greens. We couldn’t wait to hit Cafe Miranda, located in an old gambling club and named after chef Kerry Altiero’s late pooch. Altiero is considered one of the pioneers of Rockland’s burgeoning food scene (he opened the restaurant in 1993) and his menu is a delightful mash-up of styles — some Italian, some Asian, all bold flavors and pun-driven names. We couldn’t wait to try his brick-oven-baked mac ’n cheese, and given that it cost $30 with lobster added in (this is optional), we would share. Could Altiero make this gooey standby exciting? His was definitely a different take on lobmac, studded with bits of tomato and topped with greens, but not the swoon-worthy concoction we had hoped for. Still, we ate every decadent fork-full. Ambling around downtown — almost all of Rockland’s eats are within walking distance of each other — we stopped at Suzuki Sushi. We had heard great things about chef-owner Keiko Suzuki Steinberger’s skills, and the place looked inviting. Alas, no lobster that night, although the summer menu often features cooked chunks of lobster with avocado, wrapped in seaweed. “I’d make a trip back for that, for sure,” Pam said. Temporarily lobstered out, we headed back to the Granite Inn. We woke up to lobster, nestled in pastry with egg and cheese, made by innkeeper Joan Hantz. Over breakfast, Hantz shared a tip: “I often send guests over to Jess’s Market to get a cooked lobster to go,” she said. “It makes a great picnic on the water.” A quick visit to this family-owned fish market revealed that they also serve crab rolls and lobster rolls, year-round. “Try our version of the quarter-pounder — it’s a quarter-pound of lobster meat,” proprietor Jamie Johnson urged. It’s served on a kaiser roll, not a grilled hot dog roll, per local custom. “Simple. And. Delicious,” Connor said, quickly dispatching the lobster roll (currently $13.99). 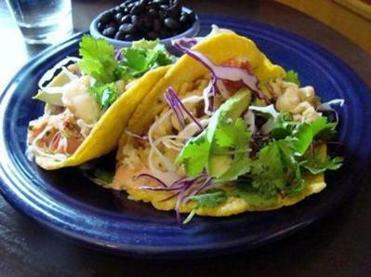 HOME KITCHEN CAFE - Lobster tacos come with black beans, avocado, red cabbage slaw, and cilantro. As it turned out, the best was yet to come: the lobster tacos at Home Kitchen Cafe. These were the folks who had promised to put lobster tacos on the menu for us (unaware that we were writing a story) and we saw that the dish was “today’s special.” We loved the feel of the place — all bright paint and colorful Fiestaware dishes — but we fell hard when we tasted the tacos (served two to a plate with black beans), a winning medley of lobster meat, avocado, red cabbage slaw and cilantro, stuffed into house-made corn tortillas ($19.99). This was a last-meal-worthy lunch. We loved it. Because we got a jump on the season, we were too early to feel the love at mid-coast Maine’s lobster pounds. These eat-in-the-rough places offer what many consider to be the quintessential Maine dining experience. One local favorite is James Beard award winner Waterman’s Beach Lobster in South Thomaston. This is no-frills dining with dreamy views of the Atlantic, located off the beaten track. (Waterman’s opens in mid-June.) Another standout, because it offers “the cheapest lobster dinner around,” according to a local lobster-lover: Doug’s Seafood in Port Clyde. At this roadside shack on Route 131, you sit at a picnic table and eat lobster Doug caught himself. Heading back to Boston, we agreed that Rockland is a worthy destination for all things lobster. They turn out some tasty dishes featuring our favorite crustacean, they offer some pretty spots to enjoy lobster-with-a-view, and they don’t commit crimes against lobster, like frying it, or churning it into ice cream. Diane Bair and Pamela Wright, authors of “Maine Coast Revealed,’’ an iTunes app, can be reached at bairwright@earthlink.net.